Obituary – Brown, Doris Myrtella (Baetz) « Perry High School Alumni Association, Inc.
– daughter of Mr. and Mrs. Otto M. Baetz was born October 31, 1919, in Noble County, Oklahoma. She attended elementary school at White School, District 15, and the Lutheran School in Perry. She attended high school in Perry. While a student in Perry High School she was a member of the Glee Club four years, and a member of the Red Hot club two years. Following graduation, she expects to go to business college. 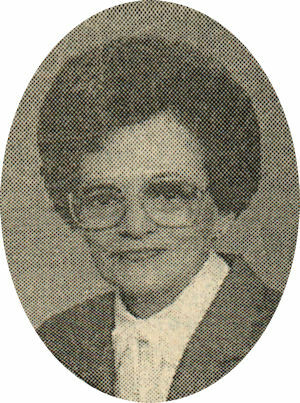 ﻿Doris Brown was the daughter of Otto and Myrtle (Carrier) Baetz and was born in Perry, OK on October 31, 1919. She died Thursday morning, January 24, 2002 at the age of 82. Doris was a lifelong resident of Perry, she graduated from Perry High School in May, 1936 and Draughon Business School in 1941. She and Edward J. Brown were married on July 29, 1944 in Casper, WY and during their fifty-one years together, traveled to all fifty states and Washington, D.C.
Before retirement, she worked as a bookkeeper in Perry for Donahue & Mugler, Smith Trucking, Tucker-Loftis Insurance and R. L. Frailey. She was a member of Christ Lutheran Church, a charter member of Unit V and General League and served many years as a Sunday School teacher and choir member. She was preceded in death by her husband, her parents, one son Jim and a sister, Opal Elliott. She is survived by daughters, Alanna Brown, of the home in Perry, and Charlene Brown, Douglasville, GA; her only grand child, Staci Diane Brown, Denver, CO; one sister, Manila Francis, Perry, OK; one brother, Charles Baetz, and his wife, Leona, Dangerfield, TX; and many beloved nieces, nephews and cousins. Funeral will be at 10:00 a.m. Tuesday, January 29, 2002 at Christ Lutheran Church with Rev. Myron C. Maltz officiating. Burial will be in Grace Hill Cemetery under direction of Brown-Sisson Funeral Home. Memorials may be made to Christ Lutheran Church or the Perry Alumni Association.